Your listing has been submitted – thank you! Make your budget go further and reach a new audience with a bespoke, targeted email campaign. Get your contest seen by thousands of visitors each day. We have a range of ad placements available. Enhance your Photo Competitions listing with our range of value-for-money add-ons. Save over 50% with our great value advertising package, offering you 8 weeks of ad space and 2 listing add-ons! Make your budget go further by honing in on a targeted audience. We can filter our database of photographers by nationality, age, photographic genres, photographic locations, experience level and more! You only pay for the exact number of targeted users that you reach, ensuring that you get maximum value-for-money. We use state-of-the-art email systems to ensure maximum deliverability and compliance with the CAN-SPAM act. We restrict the number of emails sent to our users, thereby avoiding email fatigue. We work with you to create an effective and 100% bespoke email campaign. Please describe your contest and the campaign you would like to run. Please also describe the audience you would like to target (e.g. genres, nationalities etc.). Down to $239.40 with our bulk discount! 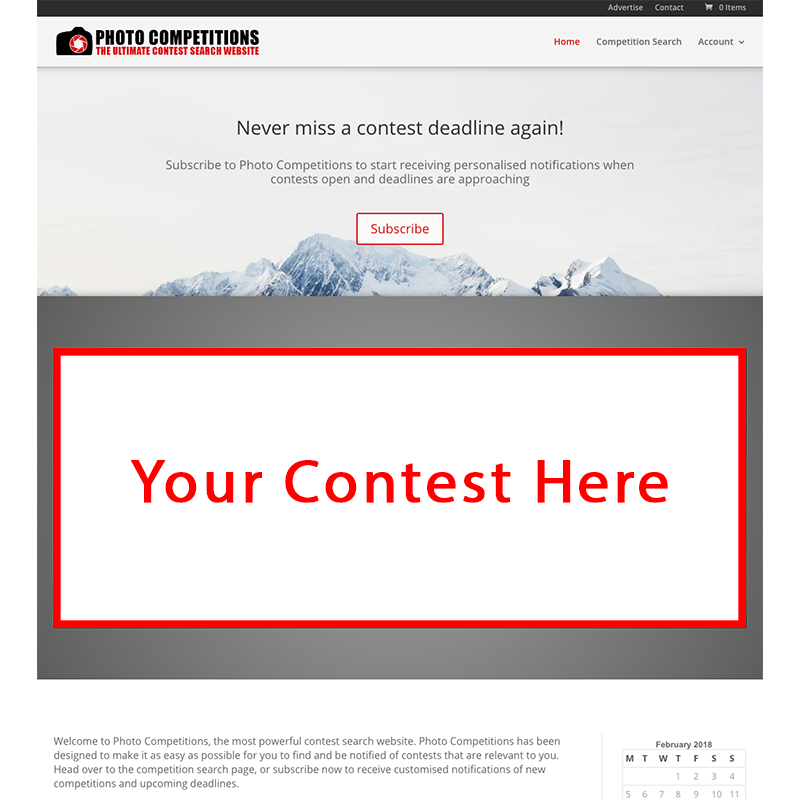 Put your contest in the spotlight and enjoy prime positioning on our homepage. We’ll work with you to create custom artwork for your ad. Benefit from an ad up to 1080px wide on our homepage. This is an exclusive ad placement, meaning your contest gets 100% exposure during the purchased period. Down to $15.00 with our bulk discount! Enjoy great value-for-money as a featured contest. Guaranteed placement for 100% of the purchased period. Benefit from prime placement on our homepage. This ad automatically uses your existing listing logo and excerpt, meaning zero extra effort from you. Down to $30.00 with our bulk discount! 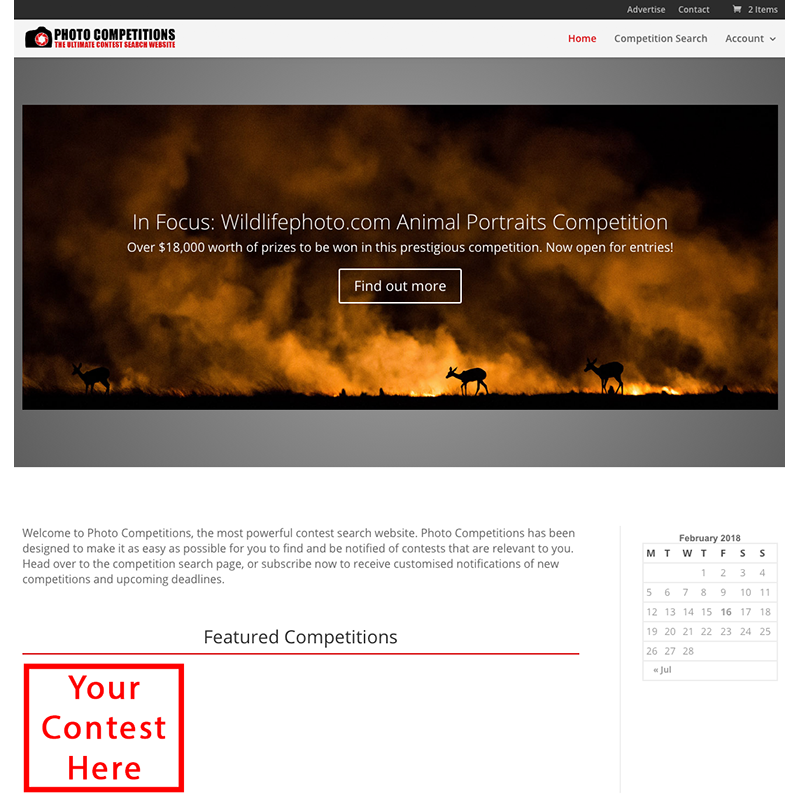 Have your contest featured throughout the Photo Competitions website. These ads link directly to your contest website, meaning high conversion rates. Automatically make use of your listing logo, or create bespoke artwork, the choice is up to you. Now with a free 1 week featured contest ad! Standard Photo Competitions listings can only be updated once every 11 months. The Priority Listing Add-on gives you unlimited edits for 1 year, allowing you to keep your listing up-to-date with the right information. Plus, we guarantee that your submissions will be reviewed within 24 hours. You can also purchase the Priority Unlimited Add-on so that you can make unlimited edits to your contest listing – forever! 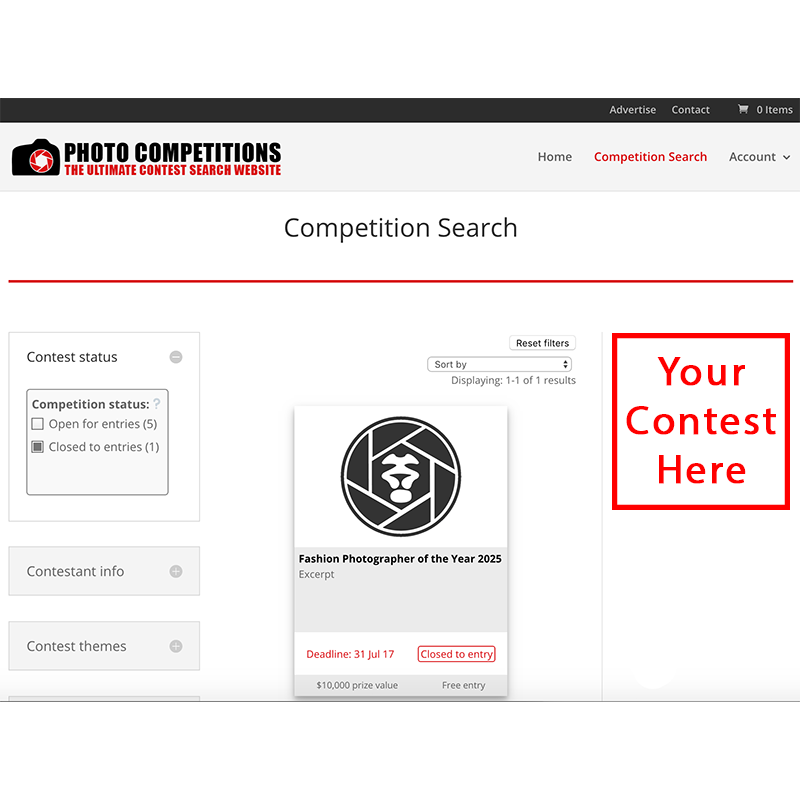 Standard Photo Competitions listings are emailed out to our users once over a one month period after opening or first being listed on the site, and twice before closing, within two months of the deadline. With Newsletter Plus, you can extend this so that your contest is emailed to users twice after opening (over a two month period) and three times before closing (over a three month period). You can also give your contest an extra traffic boost when the results are announced by sending an email to any one who has “bookmarked” your contest. This is fully automated – you just need to let us know the URL of your results page and the date they will be released! Your subscribers will be retained year-on-year, meaning the number of users emailed will get bigger for each year that your contest runs! Save over 50% with the Ultimate Contest Bundle! Get 8 weeks as a Featured Contest, 1 year of Priority Listing and 1 year of Newsletter Plus, all for just $160.00!